Innovation policy is a complex composition of policies that influence the innovation capacity and success of a society, that shape a society’s innovation fitness. This set of policies usually does not cover the entire innovation landscape, but leaves the fringes of the landscape unattended. In a subsequent post, I’ll take a look at the area of known supplies and known demands and the unintended consequences of innovation policy. But today, I’ll first focus on innovation policy that embraces novelty, i.e., policy objectives especially tailored to novel supply and novel demand. I consider this a forward looking innovation policy. In order to fully embrace novelty, I can see three objectives for innovation policy, and they are partially connected. The first is to encourage novel supply; that’s what I’ll address under the label of access. The second is to anticipate or preempt novel demand; I’ll label that anticipation. The third is at the intersection of the other two: dealing with situations where novel supply must be generated to deal with novel demand; I’ll call that shock. As those labels might not be immediately intuitive, I’ll try to explain why I chose them, one after the other. Conventional innovation policy views and addresses novel supply as the generation of new ideas. This is the domain of research, characteristic of the second quadrant. Such policies promote research as an investment to the future, they encourage science education, they pursue specific scientific disciplines or push the development of specific technologies. All good and well, but these policies are usually domestic policies, i.e., they are solely focused on the very society (in most cases, the very nation), which issued that policy. This limitation of scope poses a serious constraint on the supply of novel ideas that this society has access to: it’s left to its own devices. For a society to reach beyond these limits, it must issue policies that encourage access to ideas that are generated elsewhere. While these external sources of ideas should always be seen as a complement to home-grown supply of ideas, they nevertheless present a novel supply in its own right. And they do not simply enhance the quantity of accessible novel ideas, they also can have tremendous influence on the quality of novel ideas: through the cross-fertilization that occurs when ideas from different sources meet. That is the main purpose of international collaboration in science and research; you can even consider citizen science as another approach to access unconventional sources of ideas. Traditionally, smaller nations have more easily adopted innovation policies that facilitate access to external sources of ideas, whereas larger nations tended to rely on their own strength and their own supply. However, the patterns of strength and weakness are shifting and sliding, and a strength of the past is no guarantee for future success anymore. Today, as innovation is at the forefront of globalisation, the times of ideas travelling together with people on horseback are long gone. Today, ideas move a lot faster than the brains that created them, ideas travel at the speed of light. Therefore, its is easier than ever before to get access to ideas from other sources. But we need to embrace these opportunities and actively seize them. Most societies have little policies that are tailored to novel innovation demand. Such policies focus on the response to novel demand when it arises, e.g., by reducing administrative red-tape for starting a business, offering tax breaks for founders, or facilitating access to venture capital. This covers some part of the disruptive third quadrant of the innovation landscape. But similar to the discussion on novel supply, an important aspect is missing: the anticipation and potential preemption of novel demand. That might seem a daunting task at first glance, but I’m far from proposing the perfect crystal ball. Rather, I’d suggest that we must be aware of what is going on outside our society to identify innovation demand that might hit our society in some future. Once again I want to focus on the international dimension. Think about horizon scanning in the very sense of the word: we need to look at the horizon, and ideally even beyond, to see where we are going what is coming our way. Successful horizon scanning for innovation requires leaving behind the strict geographical connotation of neighbourhood, i.e., the countries our society shares borders with. It requires a broad understanding of neighbourhood as “how our society is linked to others”: through trade and commerce, through comparable legal systems, through historic clashes or affinities, through shared traditions, through shared geopolitical interests, through an infinite number of levels and layers. Such broad comprehension of neighbourhood will help identify the kinds of novel innovation demands our neighbours are already exposed to. These demands might knock on our door in some future, and knowing that in advance creates the opportunity to prepare. Knowing our neighbours emerging problems is a path to anticipate our own novel demand. Therefore, innovation policies must encourage the scanning for the weak signals and early warnings in the expanded neighbourhood. The combination of new demand with new supply of course presents a puzzle. But unfortunately, innovation policies are usually not tailored for such circumstances. This lack of policy might seem logical if we assume that such situations are too rare to occur in our own lifetime, but you might consider it unwise given the risk entailed, the risk of drastically altering the fundamental inner workings of our society. I see shock as the extreme end of the wicked fourth quadrant. It’s the type of conundrum where we neither comprehend the underlying problem nor do we have the means to solve it. As a result, there are conflicting views between and within politics, economy, and science as to what the problem is or whether it is a problem at all. Think about global warming of course, but consider ageing populations, failing states, or even the global economic crisis. There are more opinions than there is genuine understanding, but I would offer that these kinds of highly complex challenges are all beyond the grasp of any single society; these challenges are of truly global scale. But is there anything that policy can do? As always, policy sets the conditions for success or failure. In order to avoid shock, we must first realise that our conventional policies are not tailored to these challenges; they are not made to handle novel supply and novel demand at the same time. Our rules and institutions have evolved over time to handle known demand; and our organisations have been designed to manage known demands and known supplies as efficiently and effectively as possible. By extension, some of the institutions apply to novel demand or supply, and some organisations (e.g., universities or research establishments) play significant roles in generating novel supply. Still, on the whole we usually do not have dedicated policies in place. 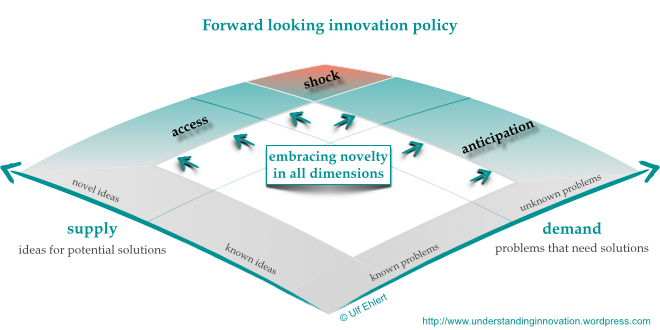 Policies that effectively avoid shock must promote and facilitate meta-innovation, i.e., innovation that changes the way we do innovation, such as new institutions, or alternative, more agile organisations. And they must seek to integrate such institutional changes with the necessary supply of novel ideas to understand the underlying problems in the first place. I would add that such policies must be internationally coordinated to be successful. And I am truly heartened by ideas like the grand innovation challenges we can unite behind, posted just a few days ago. Cutting across the three policy objectives sketched above, I feel that the most important take-away is not so much policy advice, but rather philosophical in nature. If we are fully aware of the differences between a single society (a.k.a. nation) and the international dimension (multi-national to truly global), we will also realise that we cannot really control all the demand or own all the supply. And if we are serious about international collaboration in innovation, we must accept that the concept of ownership and control that is traditionally engrained in our societies will not apply in the future. We will have to go beyond control and ownership and seek innovative ways to benefit from voluntary sharing; sharing of ideas, not only of resources; sharing of responsibility rather than sharing of ownership. That will be an entirely different approach to innovation, but an approach that has the potential to master the challenges ahead. For innovation policy to embrace all facets of novelty, we should encourage emerging understanding, promote the diversity of ideas, and harness the richness of opinions and sources. Approaching innovation with such an open mind promises better success than the control-focused ideas of the past. I’m curious to learn your views.